Burkhard Klüver studied law in Kiel. He joined Ahlers & Vogel as a legal trainee in 1984, was admitted to the bar in 1986, is a bar-certified specialist in Tax Law and has been a partner since 1990. This was followed by his appointment as a civil law notary in 1994. After around 12 years of working mainly in the field of international Shipping and Transport Law, Mr Klüver turned his attention to the field of international Trade/Company Law and Tax Law, particularly customs and excise. 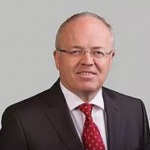 He has been lecturing Customs Law at the German Lawyers Academy for many years and publishes on the fields of VAT, Customs and Export Control Law.